Today is the 3rd day of sneak peeks from Taylored Expressions and I am so excited to show this project that I made using the absolutely darling new Calendar Critters stamp set and Calendar Critters dies with the 2016 Mini Tear off Calendar. 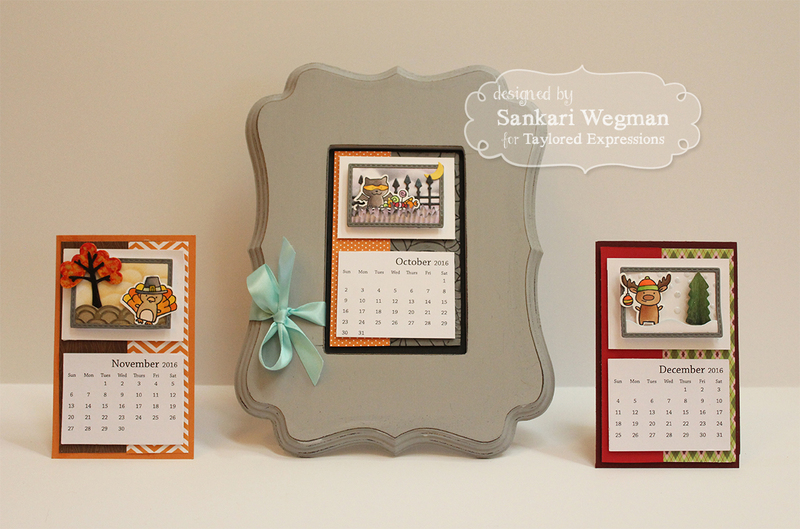 This mini tear off calendar comes in a set of 10 (a set of 10, I tell ya!!! That is awesome!) !!! 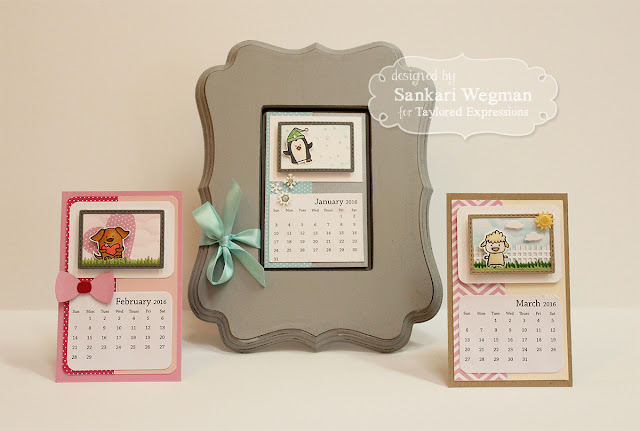 I wanted a way to display each month and so I took one of these gorgeous We R Decorative Wooden Frame and I tore off each month to create a 4x6 panel that will fit into this frame. I created a little mini scene with each of these using the Build A Scene - Calendar dies that comes with a mini frame, fence, cloud, sun and grass set of dies... so so so cute!!! 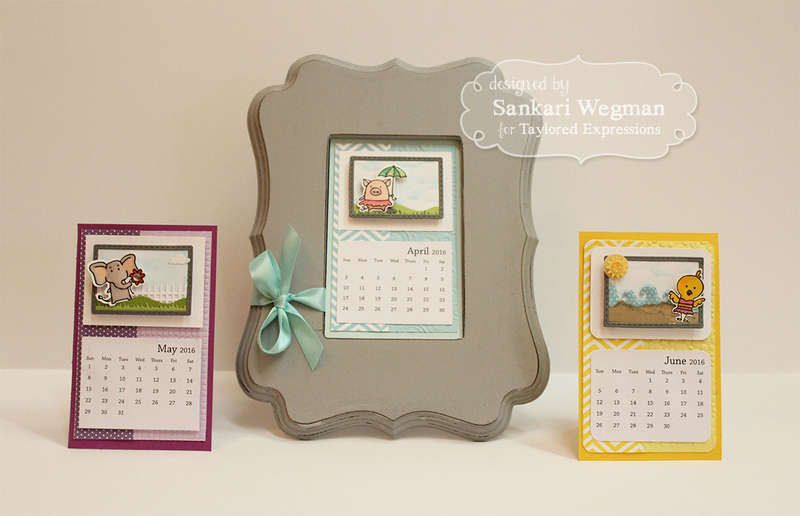 Here are all 12 months and one in the frame to show how you can display it on your desk or anywhere!! Taylored Dies: Calendar Critters, Build a Scene – Calendar, Stitched Banner Stacklets, Cloud Duo, Designer Mini Tags, Markers (Copic), Pico Irresistible , Liquid Applique, Foam tape. Here are the first three months --- isn't this penguin so cute - but wait, there is an adorable puppy holding a heart and a sweet little lamby welcoming in March!!! 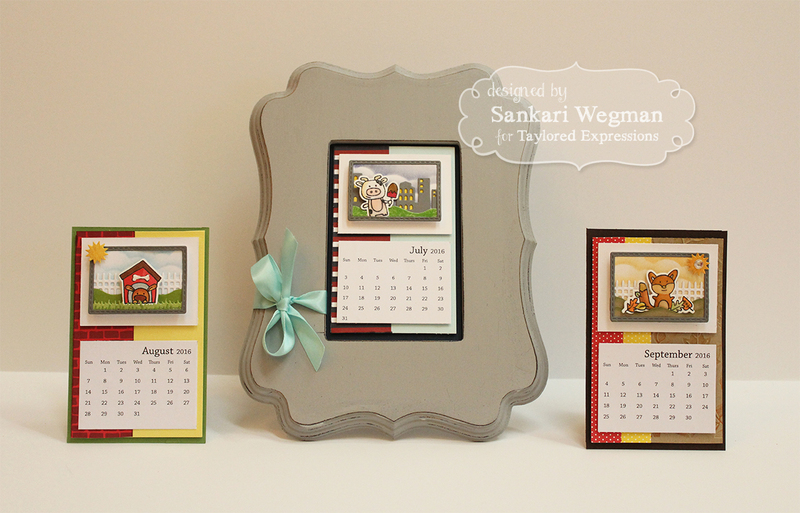 I loved making a scene for each of these months and loved how they each fit into the frame!! Here are the next three months - love the feeling of the April showers with this little piggy holding an umbrella! And then May flowers with this sweet elephant holding flowers and then this cute little beach babe duckling -- soooo adorable!!! The next three months are so fun! I made the sweet cow have a day in the big city for fourth of July and the little doggy in the dog hosue is adorable for August and you can really feel fall with this sweet little guy in September! For the last three months, I just love this sweet little Halloween trick or treater with his candy loot, this cute little turkey in a fall scene and the little moose with an ornament in his antlers! LOVED making this project of all 12 months!!!! These Calender panels with frame are so adorable and i love how beautifully you display them! Your little scenes are so sweet and I love the extra detail of the patterned papers behind them! What a wonderful gift this will be! Each one is so cute...Whole frame and the display is just superb! Oh Sankari, these are so AWESOME. You put so much detail into each calendar. Thanks for the inspiration. Can't wait to get my own set. Seriously ADORABLE! Every single one is my favorite! I love all the little scenes you've created. I love how you use the fence with the other options in the build a scene calendar set. Amazing creativity! Thanks for the inspiration. These are so cute and a great way to show case them for use. I will have to remember that. OMG, the calendars are the cutest! Ever! So adorable!